Recently, I’ve shifted gears. After finishing about 98% of my novel, I’m taking a breather so I can let my mind recuperate. During that time, I’m focused more on writing short stories and I’ve discovered one great feature of LSBXE that helps me churn them out: Builders. 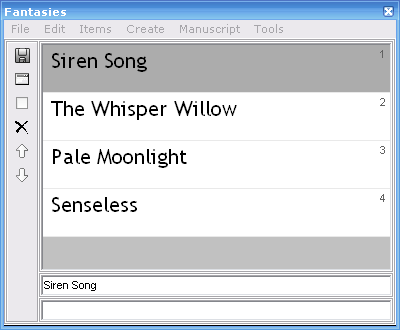 LSBXE allows you to create Books. I’ve created a Book aptly titled ‘Short Stories’. This allows me to keep my short story writing separate from any items I happen to be working on. If you’re already lost, I recommend reading the following tutorials before continuing: Library Tutorial and How to Create a Planner or read my previous tutorial How to Use LSBXE for Your NaNoWriMo Novel which covers the basics. Once upon a time, I created a new Planner for each short story, but I’ve revised this thinking. Instead, I now see my short stories as part of an anthology. Thus, I create an umbrella Planner for each body of stories. For example ‘Fantasy’. All my fantasy short stories will go in that Planner. My only exception now is when I’m certain I’m planning an entire series of short stories with the same characters. Then, for each new story I plan to write, I create a new Planner Item. This is simple enough to do by selecting “Create -> New Item” from the Planner window. With my Short Stories book and my anthological Planner, it’s time to start building each story. Builders are very much like Planners on a smaller scale, for fine tuning scenes within chapters. At least, that’s how I see them. Using one of my recent short stories, I created the new Planner Item and named it after my short story: For the Sake of Love. Then, from the Planner window, I selected “Create -> New Builder“. 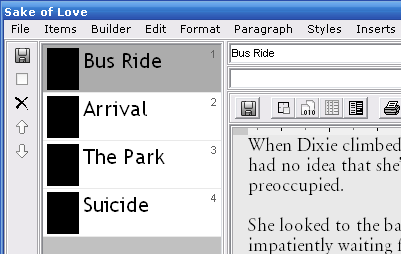 I was then able to write the story in its individual parts: Bus Ride, Arrival, Beach, and Suicide. When each of the scenes were complete, I allowed LSBXE to compile them into the whole story for me (as a Chapter in the Planner). That was accomplished by selecting “Builder -> Build All Items“. Of course, some stories don’t need a Builder because they happen in one area and this is only one use for the Builder. You can use them to help you build the more involved chapters of your novel. But I hope I helped to get the creative cogs turning in your mind. Short and to the point. I really like your idea of organizing the stories. Will try it out with LSB. Thanks for taking the time to write this! My pleasure. Glad it could help. Thanks for taking the time to comment. Well done description!… And it’s nice to see LSBXE getting some more appreciation. There really is nothing like it, and it only takes people like yourself to make others see that! Thanks for the kind words, Corey. I appreciate your taking the time to leave a comment and I truly am glad to help. LSBXE is a great piece of software and I can only hope to help send more people their way. Thank you so much for your tutorials. I’ve just downloaded LSBXE and I’ve spent a happy six hours working with it. Your tutorials have helped to demystify LSBXE for me. Thanks once again . I have to tell you that I’ve had LSBXE for about 6 months and just couldn’t understand how to use it. After finding your two posts, I’ve now got it set up for 2 stories. I am so happy that your posts were easy to understand, because I really felt this was a good software, but I couldn’t get it to work. Thanks for helping me! I wonder if you could take some more of the tutorials and post about them! Thanks again!